Following the band’s smash-hit debut “Highway Tune” that was #1 at both U.S. Active and Mainstream Rock Radio for several weeks, Greta Van Fleet’s second single “Safari Song” has also hit #1 on both the Active and Mainstream Rock Radio charts this week. This marks the first time in 15 years that an artist has had consecutive singles from a debut release claim the #1 spot at Active Rock Radio. Additionally in Canada, ‘Highway Tune’ spent nine weeks at #1 while ‘Safari Song’ has just entered its 12th week at #1. Greta Van Fleet has become the first artist to see its first two singles, “Highway Tune” and “Safari Song,” maintain the #1 position for nine or more consecutive weeks – at any format. The band is also the first artist to have its first two singles simultaneously in the top 10 at rock radio for three or more weeks. 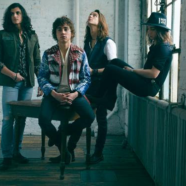 Greta Van Fleet is currently in the studio recording its debut album that will be released later this year. The band is set to hit the road on March 20 making their European concert debut with all headline dates sold out. The North American leg kicks off on April 13 at Coachella with dates announced through to early August. All North American headline dates are also sold out.